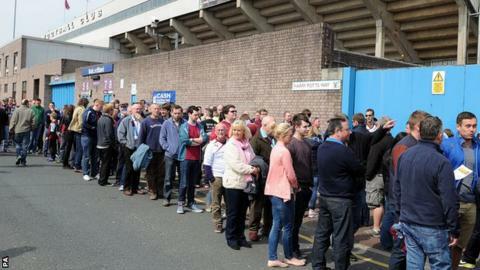 Chief executive Lee Hoos has defended Burnley's policy regarding season ticket prices for their return to the Premier League next term. Prices were frozen before the early bird deadline in March, with more than 12,000 supporters renewing their seats. But they have increased by up to 50% since promotion, including a £100 retainer that will be returned if fans renew their ticket for 2015-16. "We really need to encourage loyalty," Hoos told BBC Radio Lancashire. The cheapest adult season ticket for 2014-15 now costs £499, with the most expensive priced at £685. Hoos believes the prices are competitive compared to other Premier League clubs, and added that the Clarets did not want to a repeat of the significant drop in attendances that followed Burnley's relegation from the top flight in 2010. He continued: "We had 5,030 fans who bought season tickets when we were in the Premier League who we haven't seen since. They turned up for one year. "The idea that came back to us was that we should try and do a two-year season ticket deal. We looked at ways of trying to implement that but it became really complicated because of people changing age categories in the second year. "We said we'll look around at what other teams are charging in the Premier League and charge that price, but then if someone renews, we'll knock £100 off the price of the renewed season ticket. We thought that wasn't a bad idea. "What we're saying is stick with us and we'll knock £100 off the following year." Read more on Burnley: How did Sean Dyche secure Premier League football?